The discharge of nutrients to freshwater systems may cause eutrophication and, subsequently, various impacts to ecosystems. 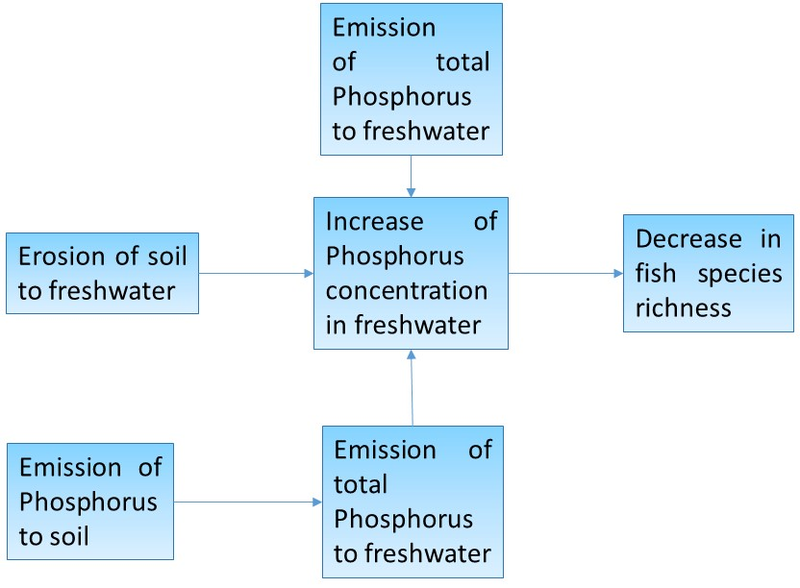 The ‘Freshwater eutrophication’ impact category includes the impacts in the area of protection ‘Ecosystem quality’ caused by the emission of phosphorus (P) into the freshwater and into the soil compartment. We propose a method to assess the eutrophication impact of P emissions to freshwater as species richness decrease caused by P emissions to freshwater (namely, the decrease in fish species richness following the emission of P to freshwater). The model consists of two parts. The first part represents the transport of P once it is emitted to freshwater. The emission of P must be defined by the user (unit: mg·day-1) and the P transport depends upon the fraction of P emitted to soil that reaches the freshwater compartment and the rate by which P is removed from a given freshwater type once it has been introduced to the freshwater compartment. This rate is determined by water advection, water use, and retention. The second part represents the decrease in fish species richness resulting from the increase in the concentration of concentration of P in the freshwater. This decrease is constant (since it is determined with linear effect factors) and it is dependent upon region and by the type, discharge, and volume of freshwater. The time horizon for this impact category is not relevant since it is assumed that the impact occurs at the moment of emission of P to soil or freshwater bodies. The spatial resolution of the model is per freshwater ecoregion of the world (FEOW). The coverage of the model is global. Characterisation factors are provided for emissions to freshwater, emissions to soil, as well as erosion.